Avid Sport, in collaboration with Better (operators of Odd Down Sports Ground) and VC Walcot will be organising the Odd Down Women’s Summer Series 2017. Running from May to July on Thursday Evenings, this series of 12 events gives women of all abilities and experiences the chance to race competitively on a consistent basis throughout the early summer. The first two rounds will feature coach-led racing with Felix Young – a chance for new racers to gain some confidence and learn some of the technical skills needed for bunch racing. The sessions will be at 7:45pm and will cost £2. Read this great write up of this winter’s coach-led racing and pursuit race (see next paragraph). The odd numbered rounds, starting with round 3 will feature a women-only E/1/2/3/4 pursuit – using the same format as was used this winter at Odd Down. This gives the chance for newer riders to race amongst their peers to hold of the more experienced racers. 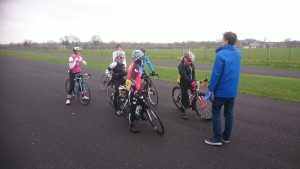 It led to fast competitive racing this winter and changed the dynamic of women’s racing at Odd Down. Races will be again at 7:45pm will cost £12 to enter in advance or £15 on the day. The even rounds, starting with round 4 will feature both a women-only 4th cat race and a women’s E/1/2/3. This is another chance for new racers to get into competition, and I firmly believe that if we can achieve the distinction between 4th cat and the higher categories we will be able to retain new racers and grow the field sizes in women’s racing to new heights. The E/1/2/3 will be a mass start race, rather than the pursuit format used in the winter. The 4th cat race will be at 7:00pm and the E/1/2/3 race will be at 7:45pm and both will cost £12 to enter in advance and £15 on the day. We look forward to seeing you at Odd Down this summer!